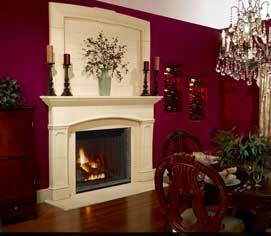 The IDV4833I Direct Vent Gas Fireplace is the quintessential true masonry look in a direct vent fireplace. The large size and clean face makes a statement in any room and meets today’s interior design trends. The direct vent system provides higher efficiencies and preserves indoor air quality. The Icon Direct Vent is a true masonry look coupled with the clean, convenience of gas. Finish your fireplace with one of two optional fronts in two finishes and one of our stunning optional surrounds, timelessly crafted, detailed and cast from beautiful sandstone.